Prince Louis Ferdinand of Prussia was born in 1772, and was an exceptional figure in the Prussian royal house, beyond which his reputation also greatly extended. Robert Schumann composed variations on a theme from the Piano Quartet Op.6, as did Beethoven’s pupil Archduke Rudolf. Liszt published an Elégie sur des motifs du Prince Louis Ferdinand de Prusse in 1847 after having been intensively involved with his works in preceding years. Schumann defined Louis Ferdinand as a “Romantic composer of the Classical period” in his diaries, and indeed some of his work does seem almost a generation ahead of its time. Romantic darkness colours parts of the Quartet, and the lyrical expressiveness and warm instrumental writing in the Trio bear this out, for while the classical style is pervasive, the music moves beyond formal constraints and has at times a similar appeal as Brahms in his more contemplative moods. My first response to the opening of this CD was “what a wonderful way to discover new music!” Prince Louis Ferdinand’s work seems to have passed me by until now, and I can’t imagine a better introduction than this series. The Trio Parnassus is recorded in a nicely resonant acoustic, and of course well up to MDG’s usual high standards. I searched through the booklet notes for some comment on the piano used, for while the trio is known as a modern instrument ensemble the piano sounds as if it might be at the very least an ‘older’ instrument – it certainly doesn’t sound like a brand new Steinway, and I for one am grateful for the fact. The piano has a pleasant, ringing sound without too much wallop in its attack or sustained tone – something which suits this music ideally, without going to the lengths of seeking out (and possibly having to endure) a contemporary fortepiano. The string playing is dynamic and rich, expressive without being overly soloistic, superbly articulated and phrased, perfectly balanced. 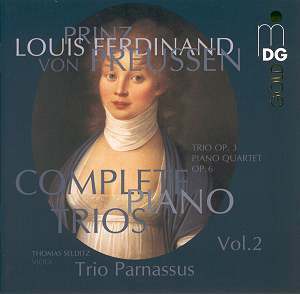 The Trio Op.3 reveals much about Louis Ferdinand’s modern approach to form, showing thematic relationships between movements to create cyclic unity, introducing some fascinating harmonic progressions, extending basic sonata form and instrumental virtuosity in one broad sweep. The sheer quality of the music in both these pieces stands out a mile. Louis Ferdinand’s ability in creating moods which take the listener away from structure and classical formality make these pieces more memorable to me than that of many of his contemporaries, and that’s only on an initial hearing. The Quartet Op.6 is probably the Prince’s best known and most overtly ‘Romantic’ work. It is filled with a treasure trove of rich invention and an abundance of strong motiefs, and its dramatic contrasts and sometimes turbulent emotional content is quite a surprise. Just looking at the scale of this work gives some indication of the emotional weight which it carries. Lyrical expression, and an almost literary depth of searching drama which foreshadows the Wertherian schmerz of much later composers has persuaded me that Vol.1 of this series just has to go to the top of my wish list. I have no comparisons to Trio Parnassus’ performances to hand, but find it hard to imagine anything much better than these recordings.